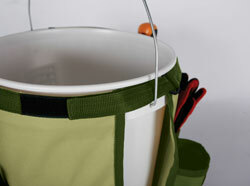 Our Garden Bucket Caddy makes it easy to carry all of your essentials when you’re out in the garden. It fits snugly on a five-gallon bucket, freeing up the internal space for dirt, yard waste or supplies. Deep, large pockets provide ample space for tools, gloves, beverages and even a cell phone. Sturdy canvas construction is light, durable and easy to clean. Keep all your essential garden tools organized and on hand. 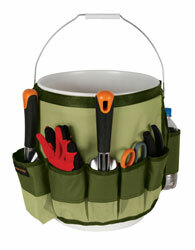 The 9424 Garden Bucket Caddy by Fiskars makes it easy to carry all of your essentials when you’re out in the garden. It fits snugly on a five-gallon bucket, freeing up the internal space for dirt, yard waste or supplies. Deep, large pockets provide ample space for tools, gloves, beverages and even a cell phone. Sturdy canvas construction is light, durable and easy to clean. The Bucket Caddy has a Lifetime warranty. Ideal for transporting a variety of small tools. (bucket and tools not included)View larger. Durable, easy-to-clean canvas construction offers lasting value. (tools not included) View larger. Includes nine deep pockets and two “pencil” pockets. View larger. Secure velcro fastener. View larger.